Postcards From The Smokies » Is It Spring Yet? Well That Depends On Where You Are. Is It Spring Yet? Well That Depends On Where You Are. Over the past week, the valleys around Bryson City have turned lush green and the Spring color is just beginning to creep up the hillsides, providing stark contrast with the still-wintry mountains above. 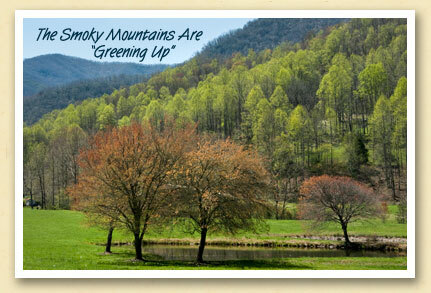 It will be a few more weeks before the “greening up” of the mountains reaches the highest peaks of the Great Smokies. This makes the next few weeks a fascinating time to drive in the Great Smoky Mountains National Park or along the Blue Ridge Parkway. You can literally watch the seasons change with each change in elevation.